Chennai is trisected by two east-flowing rivers that traverse its width. The Cooum river almost divides the city into half and the Adyar river divides the southern half of the city into two. The historic buckingham canal runs nearly parallel to the coast almost through the entire length of the city. The city has somewhat ungenerously described as having three seasons - hot, hotter and hottest. Indeed, except for four pleasant months, November to February, the weather is uniformly hot and humid.... May is the hottest season with the mercury sometimes touching 42 C and the mean temperature about 33 C. December and January are the coolest months with a mean temperature of 24 C. Howerver, the cool sea breeze (which sets in shortly after 3 PM daily) makes even the warmest of evenings bearable. But venturing out in between noon and 3 PM during April-August is best avoided. The Chennai monsoon is from October to mid-December - and in a good year (from the point of view of water-short citizens) the rain on some days during this period can be quite heavy. Chennai is located at 13.04° N 80.17° E on the southeast coast of India and in the northeast corner of Tamil Nadu. Chennai is located on a flat coastal plain known as the Eastern Coastal Plains. The city has an average elevation of 6 meters (20 feet), and its highest point being 60 m (200 ft). Two rivers meander through Chennai, the Cooum (or Koovam) in the central region and the Adyar in the southern region. A protected estuary of the Adyar forms the natural habitat of several species of birds and animals. The Buckingham Canal, 4 km (3 miles) inland, travels parallel to the coast, linking the two rivers. The Otteri Nullah, an east-west stream runs through north Chennai and meets the Buckingham Canal at Basin Bridge. Several lakes of varying size are located on the western fringes of the city. Red Hills, Sholavaram and Chembarambakkam Lake supply Chennai with potable water. 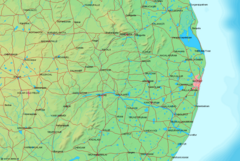 The Chennai Metropolitan area consists of three districts, the Chennai city and the districts of Kanchipuram and Thiruvallur. The city area covers and area of 174 km² (67 mi²). The metropolitan area covers 1,177 km² (455 mi²). The city is divided into four major parts namely North Chennai, Central Chennai, South Chennai and West Chennai. A bulk of the heavy industries is located in North Chennai. Central Chennai is the commercial heart of the city and the downtown area. South Chennai, previously a residential area has turned into a commercial area in recent years. A large number of IT companies are based here. Contiguous satellite towns include Mahabalipuram to the south, Chengalpattu to the south west, Kanchipuram, Sriperumpudur and Arakkonam to the west.